Take a look and you’ll see a mark at 4000RPM denoting the start of the power band, and another marking the end. 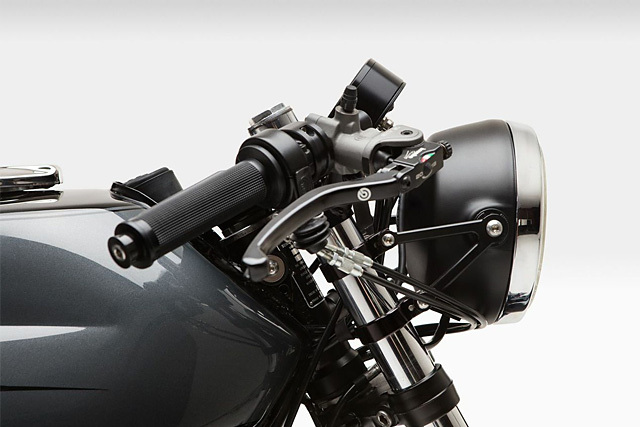 It’s all that’s needed, and it’s punctuated with the only glimpse of color on the entire bike. 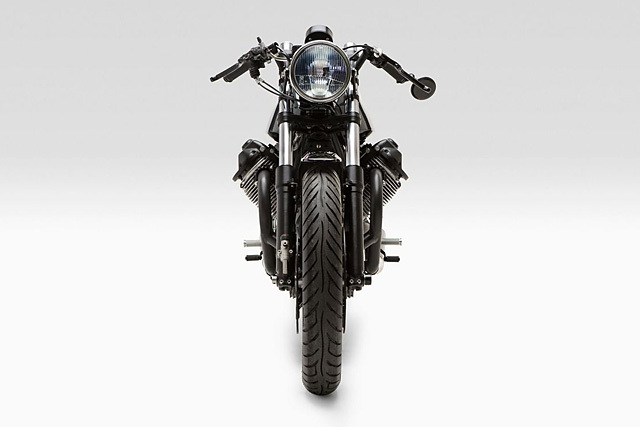 But underneath that silhouette, this bike is anything but a stock restoration. Th more keen-of-eye amongst you will have noticed that the lower rails of the frame have been eliminated entirely. 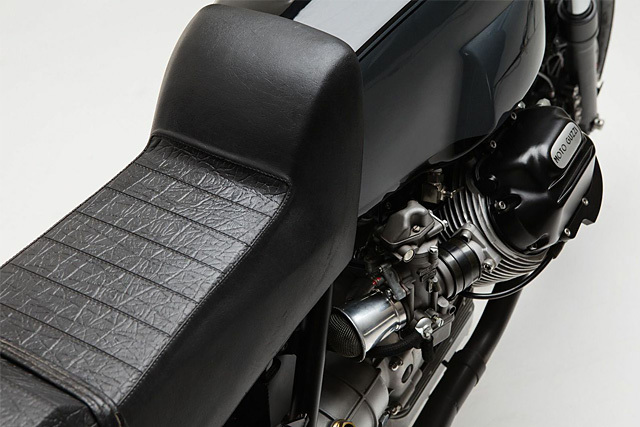 “It’s believed that these were redundant members of the famously rigid Tonti frames. Even still, the headstock was reinforced extra trusses were added to the frame for good measure” says Boggia. 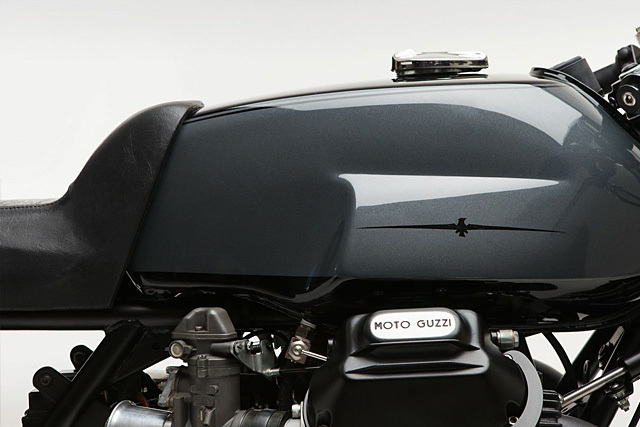 Pushing this speedy Italian towards the horizon is a 1,000cc motor that’s been tweaked, ported and primed. Even its timing chain has been upgraded; it’s now been replaced by precision aluminum gears. Like Swiss watch-making… again. 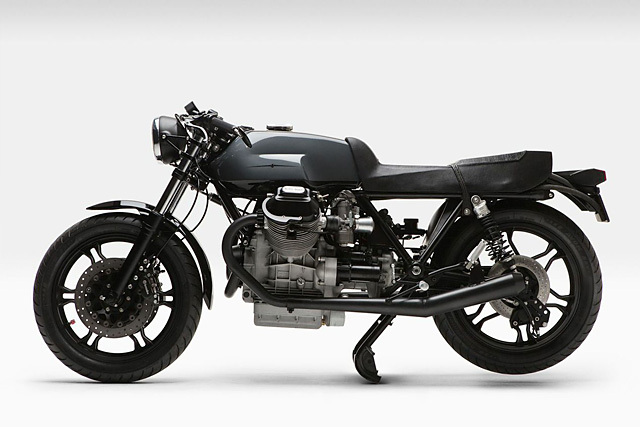 Add it all up and this bike exudes a kind of visual power, even while at rest. 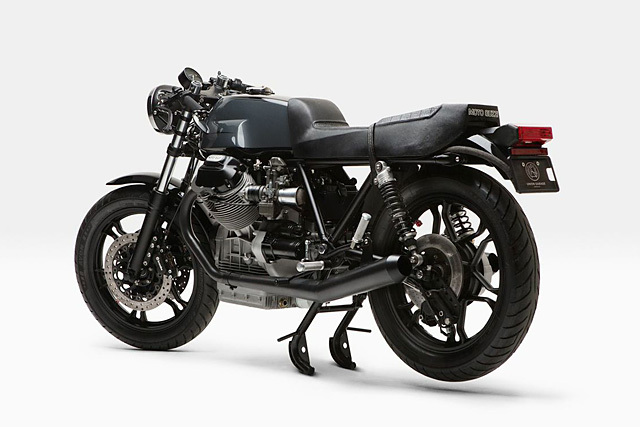 Give it some gas and its custom reproduction factory race exhaust respond with an angry, unholy roar. High performance ceramic bearings have been installed in the powder-coated original LeMans wheels, as well as in the driveshaft. 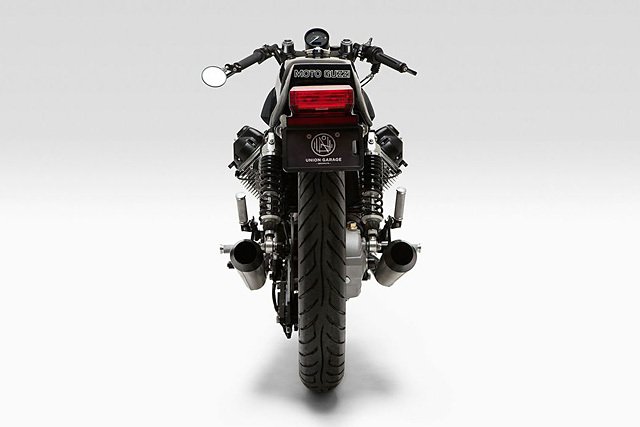 Another little secret in this bike’s performance lies is its transmission—a critical ingredient in the overall recipe, says Boggia. Upgraded suspension helps keep all that power glued to the road with YSS rear shocks and a period-correct (and progressive) Ducati M1R front end. And it stops as good as it goes, thanks to twin 300-millimeter floating rotors, four-piston calipers and a massive radial master cylinder by Brembo. 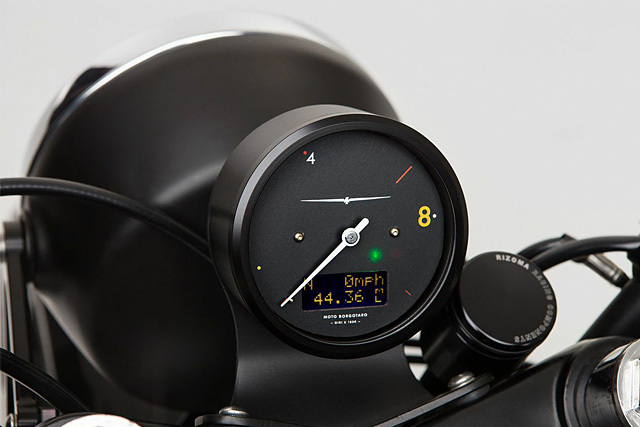 The bike’s custom wiring harness originates from a state-of-the-art German-made Motogadget M-Unit; a widget about the size of a pack of cigarettes that uses micro-processors and self-resetting fuses to streamline design and eliminate traditional relays. And those cheesy red dice valve caps? “That’s a reminder that with all this high-minded design talk, we can’t take ourselves too seriously,” says Boggia. 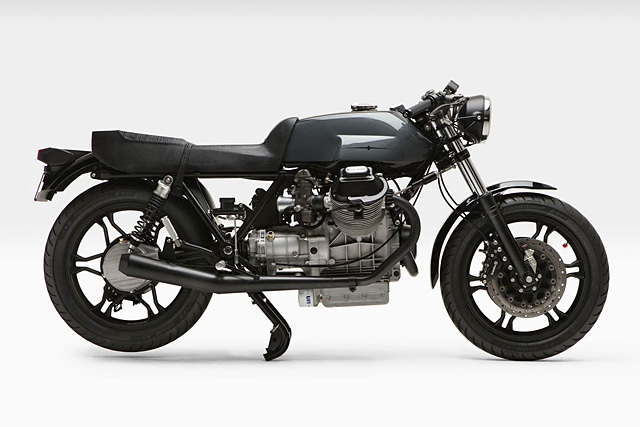 Like all Moto Borgotaro builds, this Guzzi was torn down to the crank, media blasted and hand-polished to a slick finish with oil, steel wool, and endless hours of elbow grease. Everything was rebuilt with new seals and hardware by a shop that’s successfully rebuilt so many Moto Guzzi motors, by rights they should be getting overtime cheques from Italy. And it wasn’t declared done until after one very long weekend of test riding. 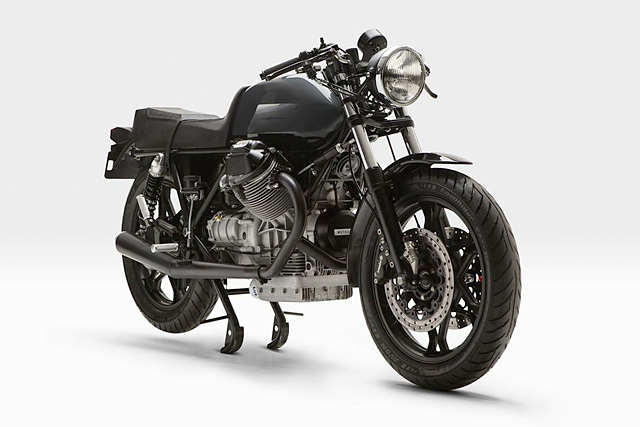 This particular recipe has apparently been refined by Boggia over 15 years of living and breathing Moto Guzzis, and will be repeated for five more bikes to be made to the exact same spec as a limited production run. Call us crazy, but we’re pretty sure you’ll have to act quickly to get your hands on one. Real quick.